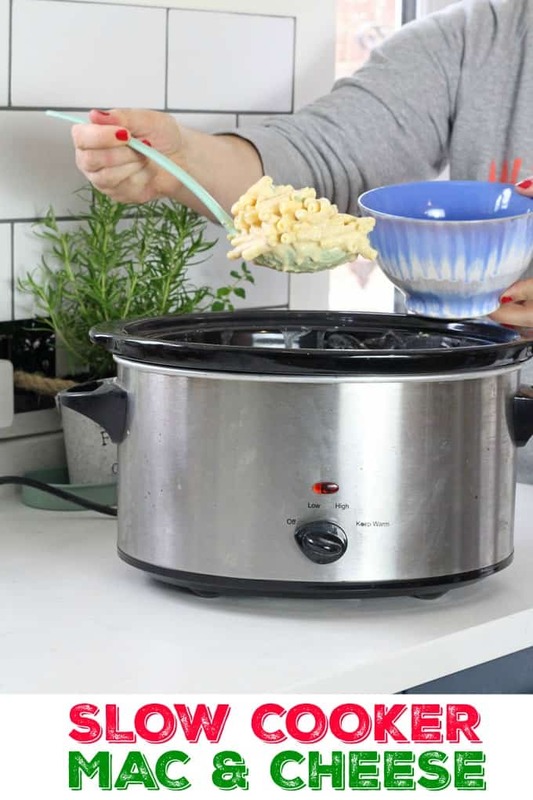 Did you know that you can cook Mac & Cheese in the slow cooker or crockpot? 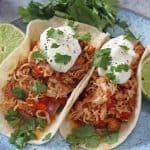 Super easy and so tasty too! 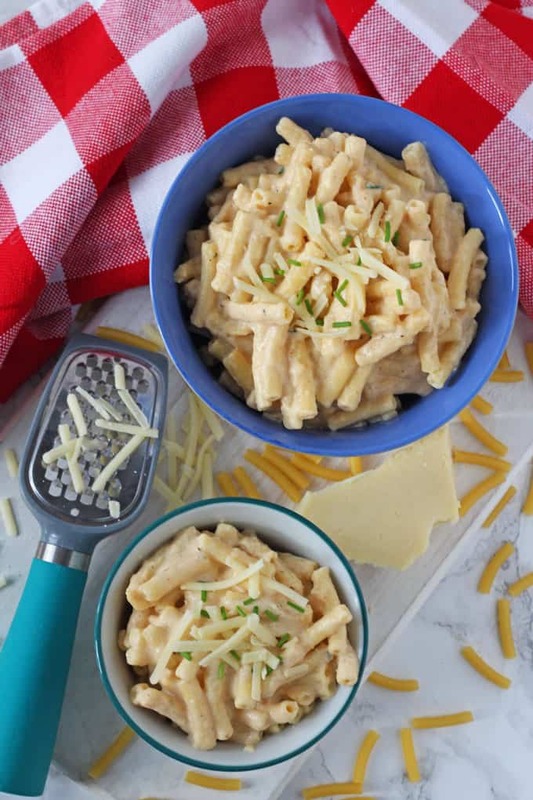 Here’s my UK Slow Cooker Mac & Cheese Recipe! Is there anything better than a big bowl of Mac & Cheese on a cold winter’s day? 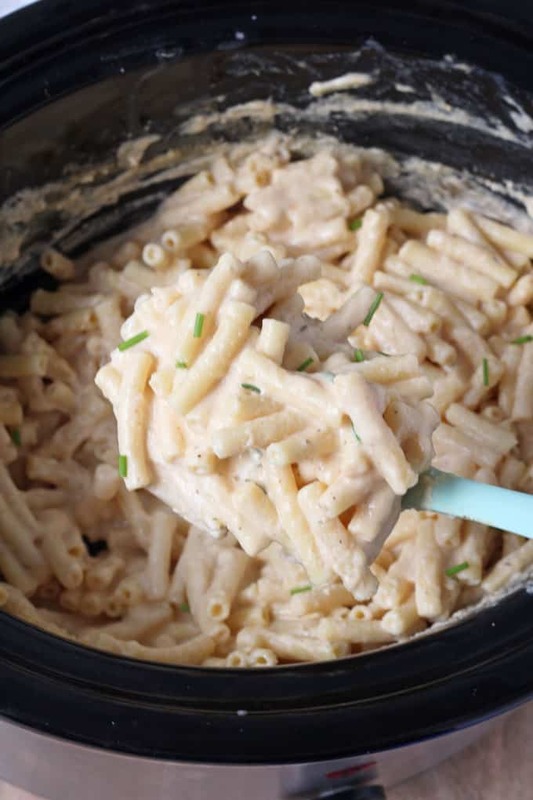 Mac & Cheese has to be my ultimate comfort food and this year I thought I’d try my hand at cooking it in the slow cooker. At this time of year the slow cooker has to be one of my favourite and most used kitchen gadgets. 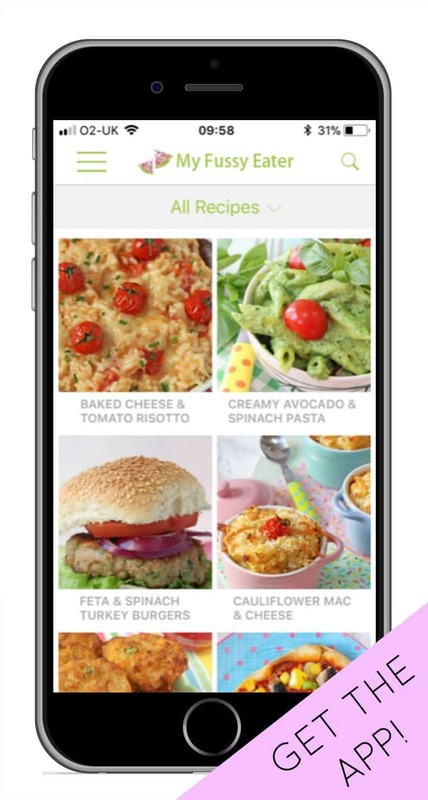 I cook so many things in it – from stews and casseroles to soups and even a full Christmas Ham! I always feel too nervous to leave the house with the oven still on but for some reason the slow cooker just seems a bit safer. I love the fact that I can throw a few ingredients in there and come home a few hours later to a hot meal that’s ready to eat! 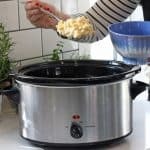 This winter I really wanted to try to make Mac & Cheese in my slow cooker. When I searched online most of the recipes were American and used a can of evaporated milk in the ingredients. 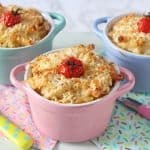 I know that this probably isn’t an ingredient that most UK families have in their store cupboard so I decided to experiment with my own recipe. 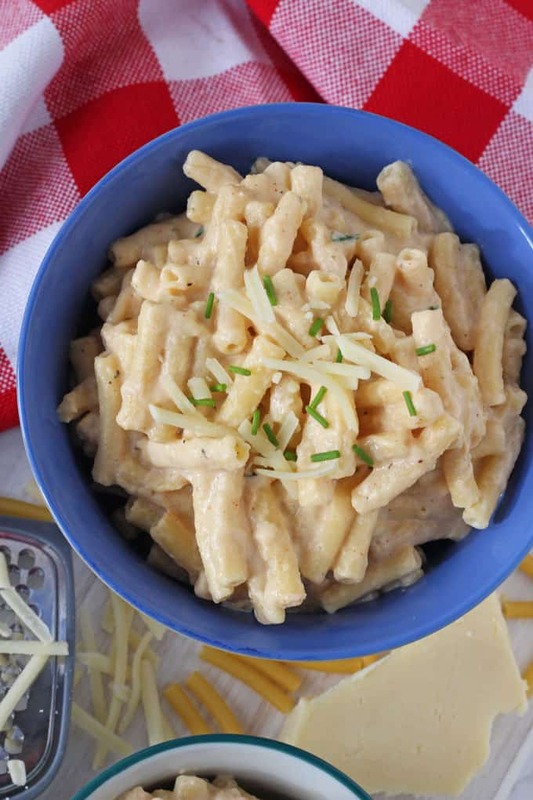 Most stovetop Mac & Cheese recipes also use flour to make the cheese sauce. I didn’t need to use any kind of flour or thickening agent in this recipe, making it completely gluten free if you use gluten free pasta. I should mention that this recipe is very dairy heavy – using milk and three different types of cheeses! 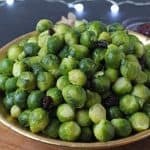 This will obviously make it high in calories and saturated fat but served no more than once a week with a side of veggies it can certainly form part of a very balanced diet for your family. 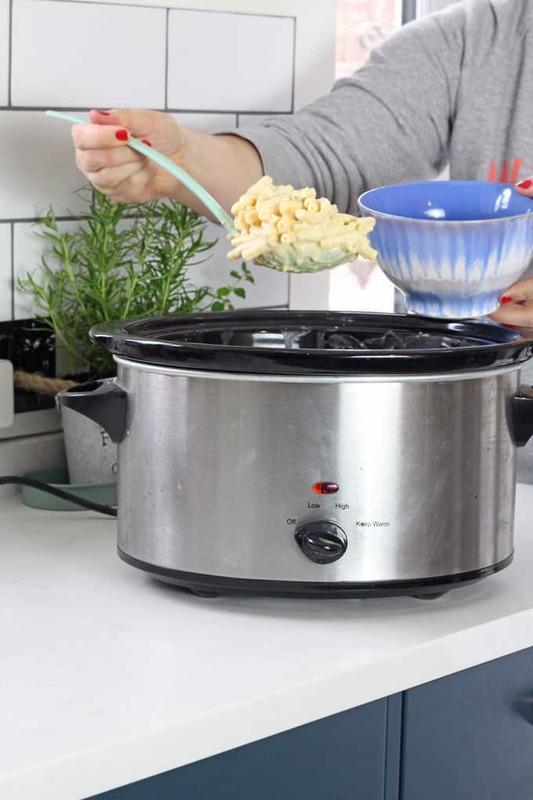 Did you know that you can cook Mac & Cheese in the slow cooker or crockpot? Super easy and so tasty too! Add the milk, egg and cream cheese to the slow cooker and whisk gently. Add in the cheddar, parmesan, paprika, garlic, mixed herbs and mustard and mix with a spoon. Finally stir in the macaroni and put on the lid. Cook on low for 1 1/2 to 2 hours until the pasta is soft and the sauce is thick and creamy. Stir a few times to make sure the cheeses are evenly mixed. Serve immediately or keep in an airtight container in the fridge for up to 2 days. « WIN a Week’s Worth of Shopping Vouchers plus a Prince’s Hamper! 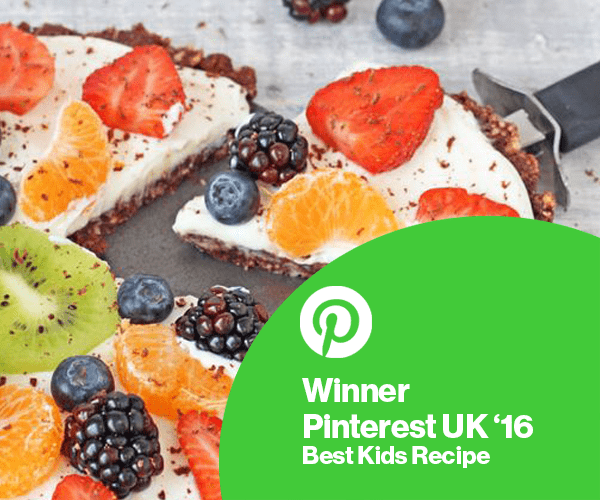 Lovely recipe my 3 year old cleared her plate- but we’ve loads left! Can it be frozen? Yes it can be frozen! It helps to thicken the sauce up but I’m sure it will be ok without out. Let me know if you try it! This came out brilliantly and despite the fact that it made loads, it all got eaten in one sitting! My husband just kept going back for more. A really good one for when you have people over for lunch in the winter as you don’t have to spend all your time cooking! These best Mac and Cheese I’ve ever made. So easy and the kids loved it. I’m at a loss as to where this went wrong…. I followed the recipe and method exactly. Sadly, by about an hour and a half the whole thing had curdled. I tried to stir the curdle out (is that even a thing?! ??????? ?‍♀️), but it just got worse and by the time I served it up it had a nasty gritty texture. I think it was the amount of time for which the dairy products had to be cooked. I would recommend part cooking the pasta for and reducing cooking time if you are going to try this and have no time to cook an alternative if it all goes wrong! Needless to say my fussy eater refused it. 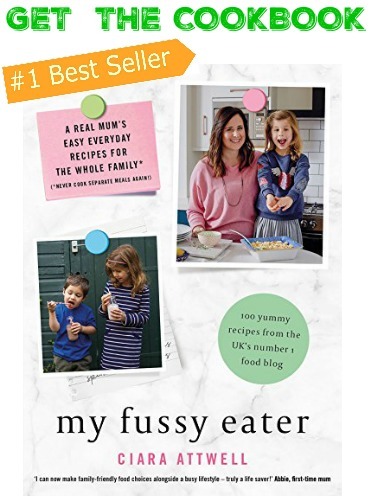 I am hoping that she won’t refuse Mac and cheese every time now as she has only just recently added it to her very limited list of things she will grudgingly eat! ???? Hi Hannah, I’ve made this recipe several times now and never had that problem. Are you using “whole” milk and cheese? If not that could be the reason that the dairy is splitting. Yes, I always use whole milk and cheese. I wonder why this happened to me?! Maybe the difference between different slow cookers? I reckon my kiddoes would love, love, love these. I am cooking this right now with cauliflower in it so hopefully it works! I blended it into the milk. Let me know how it worked out!